Smilers® stamp sheets were first made available to the British public at the International Stamp Show 2000. For the first time the British public could have their own photo-image printed next to a British postage stamp and send it to a friend or relative. Customised mail had arrived! These customised stamp sheets have opened up a whole new area of British stamp collecting and study and is presented here in great detail for the first time. Since that launch in 2000, the popularity of customised stamp sheets has grown with the British public, many 1000’s of sheets have been ordered by the public using personal images to decorate their mail. Royal Mail has also introduced additional products primarily intended for the philatelist and business user. In 2007 Ridgwood Publications published the definitive guide to these stamp sheets Customised Stamp Sheets of Great Britain providing an invaluable collectors guide for all GB stamp sheet collectors and specialists alike providing detailed information on these issues together with a price guide to current market values. Over 500 full colour ilustrations, 300+ pages, a guide to market prices and much much more. 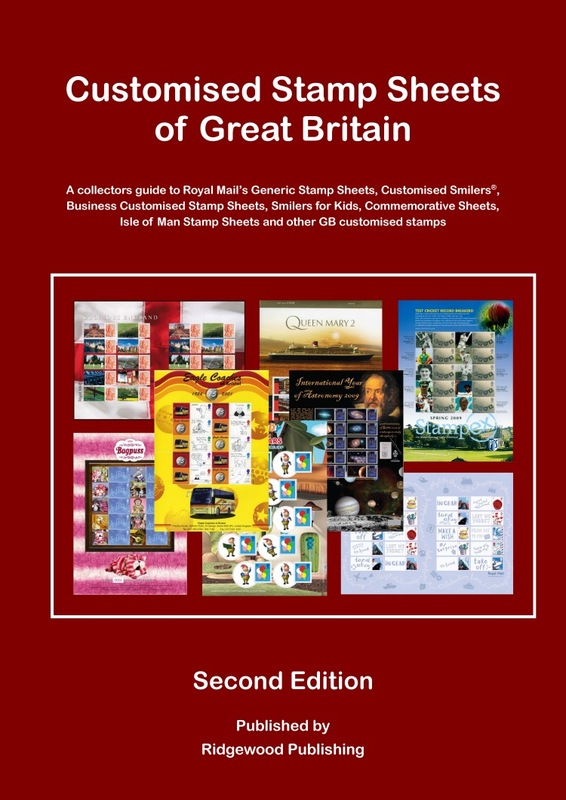 This comprehensive work has been compiled with the help of several of the country’s leading Smilers experts and removes the mystery and myths surrounding this growing area of GB stamp collecting. Adrian Bradbury's Review "a must buy"
270 Business Customised sheets are illustrated in their own section. In addition, over 500 Themed Customised Smilers sheets, produced for the Smilers collectors market by philatelic societies, dealers and individuals alike are listed.